By Joseph J. Bailey (@josephjbailey), University of Nottingham, UK. We have all been there, haven’t we? Powerlessly sitting in a vehicle amidst of a sea of pollutants. I am of course referring to the traffic jam. They are often the result of rapid urban expansion around city centres that were simply not designed with such volumes of traffic in mind. It is something that people the world over can relate to. Indeed, Statista (with TomTom data) recently released a graphic that identifies the world’s worst cities for gridlock (also see: IB Times, Forbes). Drivers on a thirty minute commute (with no traffic) in Istanbul, Mexico City, Moscow, Saint Petersburg, Bucharest, and Recife (Brazil) could expect to spend more than 100 hours a year in gridlock; that’s over 4 days a year just sitting in a car stationary in traffic! The sheer volume of waste that traffic causes (fuel, money, time) has hugely negative effects on the environment, economy, and human wellbeing. Environmentally, of course, pollutants are also a significant problem, posing risks to both the natural world and human health. 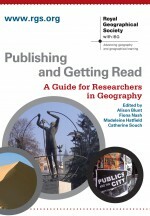 ‘GIS’, or ‘Geographic Information Systems’, is now ubiquitous in geographical research and beyond. It refers to an array of processing and analysis techniques that use spatial data and theory (see the QGIS introduction to GIS online). GIS can be used across an enormous range of research from natural disaster management and monitoring deforestation, to biodiversity science and geomorphology. This post considers GIS in transport planning. 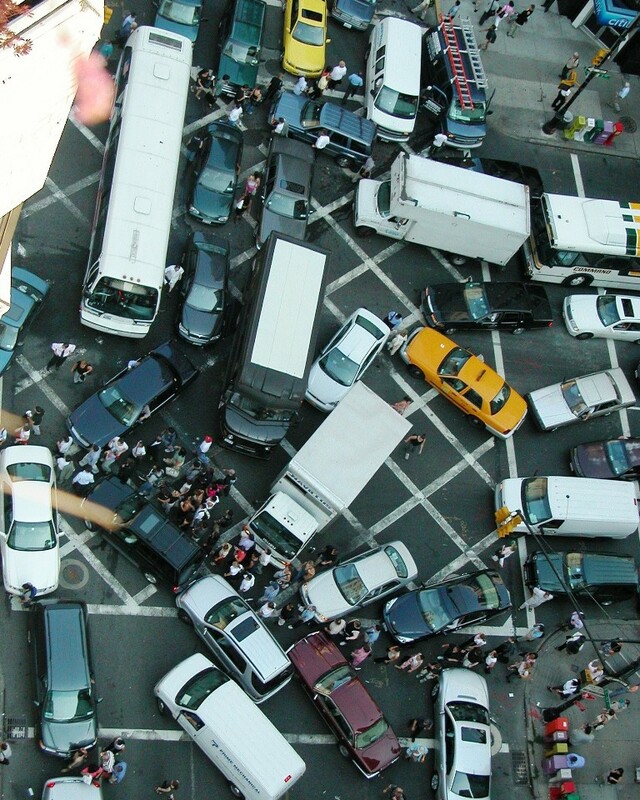 New York in Gridlock. Source: Rgoogin at the English language Wikipedia [CC-BY-SA-3.0 (http://creativecommons.org/licenses/by-sa/3.0/), GFDL (http://www.gnu.org/copyleft/fdl.html), from Wikimedia Commons. Available here. Miller and Shaw (2015), writing in Geography Compass, recently discussed GIS-T (GIS for Transportation), providing an update update on their previous work from 2001. The quote at the top of this post says a great deal in itself and, while people referring to data volumes and computing power is so common it is bordering on a cliché, it really is true and we need intelligent systems to make both sense and use of it. The heart of GIS-T projects is identified as a georeferenced transportation database, probably using a spatial network in which locations, nodes (e.g. junctions), distances, and directions can all be represented in a model. With this spatial network in place, mobile objects (e.g. people, vehicles, freight) can then be incorporated and modelled. Terrain (e.g. if somewhere is very steep) and human-imposed features (e.g. congestion zones, toll roads) can also be considered where they may affect traffic flow and peoples’ decisions. We are now comfortably into the 21st century, and new technologies can help provide information for GIS-T models. Most notably, GPS technology is widely available in most vehicles and on most individual people (via a phone or tablet). Such mobile tech means that “it is now feasible to collect large amounts of data from a wide range of mobile sensors in real-time or near-real-time at high spatial and temporal granularity” (Miller and Shaw, 2015; p. 185). A better understanding of how people move should help with urban planning, in terms of both policy making and infrastructure design, by allowing scenarios of certain decisions (e.g. creation of a congestion zone where people have to pay to drive into the city centre) to be incorporated into the GIS-T models. GIS is a fantastic geographical analysis and problem-solving tool that needs to be fully harnessed and applied to a range of problems (from traffic management to conservation planning) if we are to cope in our increasingly busy and complicated world. As we have seen here, GIS-T has enormous potential in urban planning, utilising quantities of fine-scale data that we have never had at our disposal before. Hopefully this will be able to make for more efficient and sustainable cities, towards improved environments, economies, and human wellbeing. Miller, H. J. and Shaw, S. (2015). Geographic Information Systems for Transportation in the 21st Century. Geography Compass, 9 (4), 180 – 189. This entry was posted in Geography Compass and tagged Environment and Society, Geographic Information Systems, GIS, sustainability, technology, transport, Urban planning on April 21, 2015 by J Bailey.